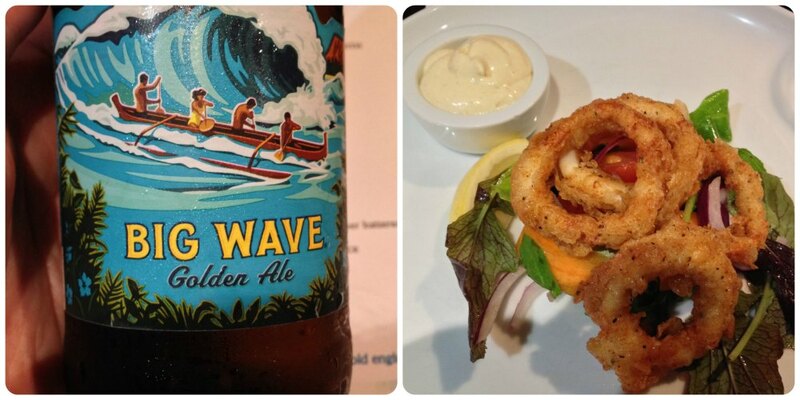 I had been looking forward to this beer and food pairing night at Manchester favourite Solita for a while. And when it fell on the night I was due to finish my post grad it was a sign! Post grad then duly got put back but damn it I was going out and drinking on a school night anyway! The night was hosted by Cave Direct and their man Will gave us an intro to pairing beer and food and then explained each pairing before each course was served. I would love to share his pearls of wisdom but this was about three weeks ago and I have a terrible memory. But I can tell you that his parings worked really well. We were met on arrival with nibbles of caper berries (yum) and olives (evil) served with Paulaner Munich larger. I don’t really drink that much larger any more but it was tasty and the salty caper berries delivered a nice punch and made me hungry for what was to come. The first course was my absolute favourite. Calamari in a heavenly light batter was served with Big Manc sauce and a bottle of Big Wave from Hawaii. Not only was the squid delicious (and how have I managed not to have Big Manc sauce on any of my previous visits?) but that beer was so crisp and refreshing! Yep I could taste the passion fruit and pineapple which Will explained were not artificial flavours but simply a result of the hops which are grown in the tropical sunshine. It was very easy drinking- I would have happily quaffed it all night and I have since had it again without food and it is equally good. The buffalo chicken wings nearly saw me off. Solita’s second hottest wings- I could only manage two, but kudos to the Irish lady sat with us who picked hers clean in no time. The Redhook Long Hammer IPA served alongside was a favourite of my husband Andrew. I sometimes find IPA a bit too bitter but this crisp and maybe a bit citrusy (again, three weeks ago) and was perfect for dousing the fire those darn chicken wings lit in my stomach! Then it was burger time. Let’s face it, you go to Solita for the burgers. The longboard burger was a Solita beef/ marrow patty topped with onion rings in Longboard beer batter, BBQ sauce and Monterey Jack cheese. And fries. As well as the beery rings this was served with Lindeman’s Kriek and Paulaner Dunkel lager. I used to like cherry beer when I was younger but blimey it’s seems so sweet now! The Paulaner was a bit malty but much better than your standard lager. The burger was deliciously messily melty! I was worried that six beers on a school night would see me off, but the generous food portions made sure that wasn’t an issue. It was a fun evening and brilliant value for money (£29pp) considering all of the food and beer we consumed. I’ll be looking out for more mid-week events like this. They are a great way to try something new – be it food or drink- and is a good price to get the punters in. If you know of anything similar in Manchester / Liverpool let me know!